When yoga mats first rolled out on U.S. floors, many thought the practice was reserved for pony-tailed hippies and New Age commune dwellers. Now this ancient practice has svelte celebrities flocking to ashrams and medical researchers studying the positive effects of meditation. The votes are in: Yoga is a yes. So if you think “down dog” is merely a puppy-training command or feel mystified by the term “chaturanga”—it might be time to look into yoga. To help you out, we did reconnaissance and spoke to four certified yoga teachers to dispel a few of the most common newbie fears and give you solid tips for how to get started as a beginner. Plus, you can check out an illustrated guide to one of the most common yoga series: Sun Salutations. To start, let’s dispel a couple of the most common fears of beginning yoga students. You do not need to be a contortionist. “Sure, flexibility is a plus, but it isn’t necessary,” explains Elsie Escobar, creator of the highly rated free podcast Elsie’s Yoga Class, whose students include 60-year-olds with arthritis. If you can’t touch your toes, there are tools to assist you. Sitting on a block can help you keep your back straight during seated poses, and using a strap or towel when you stretch your arms or reach for your toes can ease you in to deeper stretches. You will not look silly. Even if you can run a marathon and rock a Zumba class, a yoga newbie should try out a beginner class first. “People who are very physically fit will go to intermediate and advanced classes because they think yoga looks easy,” says Jennifer Rodrigue, senior associate editor at Yoga Journal. “But that is a surefire way to open yourself up to potential injury.” Beginner classes also help you learn technique, because basic points like where to place your feet, point your hips and hold your arms will be stressed more than they will in intermediate or advanced sessions. “If you have questions, ask!” Escobar says. You might feel strange interrupting class, but most teachers don’t mind. “If we can’t help right then, we’ll let you know and we can figure it out together later.” (Shy beginners can always approach the teacher after class.) And just as with any fitness class, look for a teacher you like and respect. “Make sure it’s a person you don’t mind listening to for 90 minutes and someone who is experienced and you can trust,” Rodrigue advises. If you have any injuries or medical conditions, be sure to approach the instructor before class and fill him or her in on your health concerns. If you’re ever experiencing pain or need a break, take child’s pose. “It’s the time-out pose,” Escobar explains. Place your knees on the mat, then lower your chest on top of your legs and drop your head. You can then stretch your hands out in front of you or drop your arms to your sides. It clears the mental chatter. It’s like giving yourself a break. Oh yeah—a better body and mind. Here is a guide to a sun salutation—a series of basic poses that appear in most yoga classes. 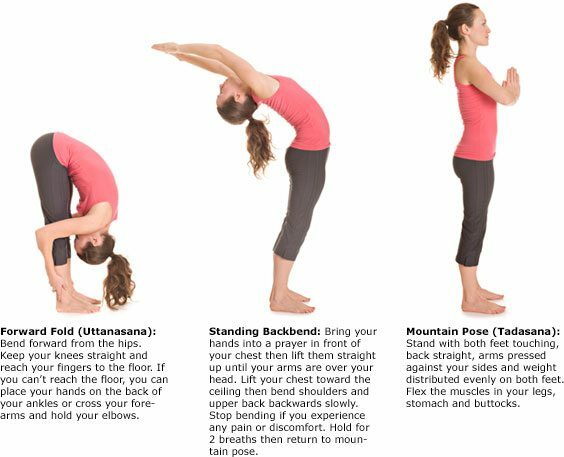 On your first try, hold each of these poses for 10 to 15 seconds then flow into the next. For certain poses we included the Sanskrit titles, which some instructors might use in class. Bend your knees, then step your left foot back until your right knee forms a right angle. Lay your torso on your front thigh and place your hands on either side of your right foot. Look forward and keep your neck straight and long. Step your right foot back to meet your left. Hold yourself up in a high push-up stance, your arms perpendicular to the ground, your back straight and your hips up (not sagging toward the floor). If this position is too challenging, you can lower your knees to the ground for extra support. From the Plank position, lower your torso toward the floor, keeping your elbows tight against your sides until your body is a few inches off the mat. Keep your tailbone firm and your legs active and engaged. Lower your body to the floor, then stretch your legs back, pushing the top of your feet into the floor. Spread your palms on the mat, then push your chest off the mat until your arms are straight. Tilt your head up so that your neck is straight. Flip from the tops of your toes onto the bottom of your toes, while also pushing your hips up into the air. Your body should form an upside-down “V” with your palms planted on the mat and your fingers spread wide. Push your heels down toward the floor, then widen your shoulder blades and pull them toward your buttocks. Step your left leg forward until your left knee forms a right angle. Lay your torso on your front thigh and place your hands on either side of your left foot. Look forward and keep your neck straight and long.